1 What Are Your Goals? This is a good way to identify the parts of your video/story. It will also help you stay on task and not get too far from your goal. What should the viewer take away from this? These questions will help you create an outline for your script. Going from point to point and following your outline will insure that you get all the information included in your video, but it will not be compelling. You can only do that by engaging your audience. Hook them in! The most important aspect of your video is to engage the audience. Whether it is a great story, a bit of humor, an amazing stat, etc. The most important thing is to get the audience hooked right away. Stick to a single message. A fatal mistake is telling too much of the story. I know that the product is your “baby” but most consumers don’t care about all the whys and where for’s. They want to know why they need it. You are making video, use visuals that will impress and captivate. Provide Insight, connect the dots. Your audience has the data, now they need the reason behind the data. Help them to understand your data with examples and applications. Setup and payoff: This is the reason the story is so compelling. Everyone wants to know what happens. There should be an appeal so your viewers are invested in your product. It’s tough to get the right and compelling CTA. You have built a good story but now you have to make sure your audience takes action. There is nothing worse than forgetting how important a CTA is and leaving them wondering what is next. Just putting up your logo and web address is too conventional and too salesy. You don’t have to wrap everything up with a bow, sometimes it’s good to leave you audience in suspense or intrigue them to an action. Your CTA should be influenced by what you want them to do. Sign up for a demo? Your narrative should direct them to this ending. Now that you have written your first draft, start hacking away at reducing the script. Using too many words only dilutes your message. A memorable video uses bold statements backed up with great video and/or graphics. Too much information: Good video scripts pack a punch. Take out anything and everything that does not need to be there. To be a good editor, you need to understand that you can cut words but preserve what matters. For your audience. Now that your story is written, it’s time to turn it around and look at it from your audience’s point of view. The success of your video depends on whether or not your audience gets it! Will they understand the concept? Write the script so your audience can get the message. Keep it simple without insulting them. Is the story interesting to the audience? This is how you keep them hooked. Again, keep it simple. Technical terms and phrases will confuse them and then you have lost them. This is so important for your video. It must have emotion and be able to tell who you are and what you are talking about. Your tone can be light hearted and refreshing even with a serious subject… if it’s appropriate. Well executed humor can help the brand. Make sure the humor is spot on and hits the mark. Your audience should get it 100%. This is tricky ground but if you nail it, the rewards are great. This is tremendously important. The written word is very different than the spoken word. Try and read a bestselling novel out loud. This is difficult to do and most times there are tongue twisters that the brain can overlook when reading. It is best if you read your script in one take and record it. The playback will tell you a lot about your script. You have now spent a great deal of time working and reworking your script. You know it inside and out. It now time for you to share it with a friend or colleague that will give you honest feedback. This process will reinforce your confidence that your script has hit the target. It is a win-win. This is a tedious process, but it will pay off in the end. Without a good script all the things that follow, no matter how good they are will not result in a success. So before you hire actors, turn on the lights and say “ACTION”, take the time to create a well thought out script. 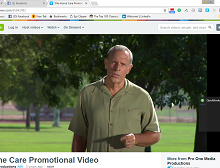 The team at www.proonemedia.com is ready to help you create a video that is perfect for your company. Contact us today at (480) 948-9310 or email pam@proonemedia.com to schedule your FREE video consultation in your office.